5G communication technology introduced from next year can process higher image quality and large-capacity contents such as VR more rapidly, besides real-time streaming service. As the communication speed increases, the relevant contents, are expected to be released, which require high resolution and large screen with graphics detailed. The current smart phone is getting bigger up to 6 inches, but it is not enough for 4K resolution of 5G communication age. Since 4K resolution is to be possible at 7-inch and larger displays, they might be the most suitable product for the 5G communication era. 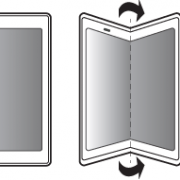 Foldable smart phones are digital convergence products that can function as smart phones and tablet PCs as the next generation mobile devices that use 7 inch or more displays but maximize portability. Owing to foldable OLED, foldable smart phones are likely to be available. Several companies have rushed to produce various prototype foldable OLED displays at exhibitions and conferences. A few panel makers even pledged to mass-produce foldable OLED displays competitively. OLED display companies worldwide including Samsung Display have invested enormous development costs in order to preempt the next generation product market, and now foldable OLEDs are starting to appear. Samsung Electronics, which is leading the OLED smart phone market, is planned to launch the in-folding type foldable phone for the first time in the world next year. Accordingly, Samsung Display has prepared 1.5R foldable OLED. For Samsung Electronics, which has suffered sluggish sales of the Galaxy S series, Foldable Phone is a super premium product that needs to be succeeded. UBI Research (CEO: Yi, Choong-hoon), an OLED research institute, has published Foldable OLED Report. 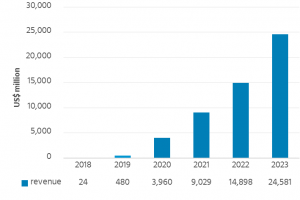 According to the report, the market for foldable OLED in 2019 is only US$ 480 million, but it is expected to grow to US $ 24.6 billion in 2023. However, foldable OLED is not a product that anyone can produce. Since foldable OLED has a more complex module structure than conventional flexible OLED, it is necessary to overcome the changes in various panel characteristics caused by folding. Especially in in-folding type foldable OLED, compensation circuit technology to overcome TFT resistance change and resilience required when folding and unfolding screen are typical technical difficulties. In order to realize this technology, the key challenges of reducing stress at the area of folding, selecting a proper substrate, determining the ideal stack structure, and optimizing the liftoff process, need to be overcome. Even when folding over 200,000 times, it is required to have reliability that there will be no abnormality on display image quality and surface. “Foldable OLED Report” published by UBI Research analyzes the development trends of panel makers together with the development issues of major films that determine the reliability of foldable OLED.